“Winds in the east, mist coming in; like something is brewing and ‘bout to begin. Can’t put me finger on what lies in store, but I fear what’s to happen all happened before.” That is how Saving Mr. Banks begins. And that is where I should have stopped watching it, because what it came next was a cryfest no chocolate ice-cream could save me from. This is the catch: if you are a huge Mary Poppins fan, as I am, this movie is going to bring out lots of feelings, childhood ones, mostly. 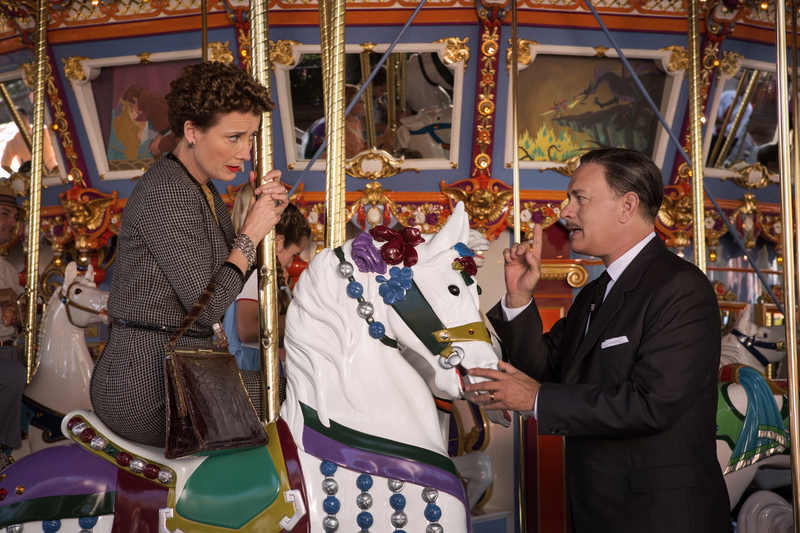 I, for one, am a person who cries a river with Let’s Fly a Kite, so Saving Mr. Banks killed me. I am pretty sure I wept with 99% of this film. Because if that wasn’t enough, this movie let’s you see what happened behind the scenes, how it was made (although it benefited Disney’s side SUSPICIOUSLY) and most important, it showed a background to the story. The movie introduces you to the characters that served as an inspiration for Poppins and the Banks family. And oh, it hurts, so very much. The damaged past of P.L. Travers is connected to the characters we love, which allows us to understand her childhood, all the things she went through. And it causes pain and joy at the same time, like when you find a toy you hadn’t seen since you were a kid in your parents’ basement. Which just reminded me of how much I cried with Toy Story 3. P. L. Travers (whose real name was Helen Goff) was reluctant to sell the rights of her books. She didn’t want songs and she didn’t want cartoons, all of which was ignored by good old Walt. The film, of course, takes some liberties, most of them tipping the scales in Disney’s favour, but it makes you come to one conclusion: a tough past defines your life and can make you grow tough. “It’s not the children she comes to save. It’s their father.” Oh, I already knew that since the first time I watched Mary Poppins, but when Disney comes to that conclusion after you have discovered what happened to Travers’ father, it becomes a bigger issue. If you have a very close relationship with your father, DO NOT watch it, because it will rip your heart out and you will spend more than half of the movie crying like a kid. Or watch it, but don’t say I didn’t warn you. PS. I just want to make special mention of Emma Thompson, who inhabits the role of P.L. Travers as if she had been doing it all her life, and Colin Farrell, who really astonished me as her father, the real Mr Banks, the one she saved in her books because she couldn’t in real life. Great, I’m crying again. Thanks 🙂 it is a great song isn’t it! I am surprised that Emma Thompson wasn’t nominated for an Oscar for her role! She is just fab in this film!